Description: Argent a Maltese cross Gules charged with a fouled anchor Or. Significance: A statement inscribed upon the world map of 1544, now called the Paris map, related that on the morning of 24 June 1497 John Cabot and his son Sebastian discovered land to which they gave the name "Land First Seen." To a large island nearby they gave the name "Saint John" because it had been discovered on St. John the Baptist's Day. Because of the fact that Cabot called this island Saint John, and also because the capital of Newfoundland, in which the Naval Division is situated is called St. John's, it is fitting to display the Maltese Cross of the knights of St. John, displaying it in red as a difference. To connect this particular Cross of St. John with the navy, a golden anchor has been superimposed upon it. Description: Barry wavy of eight Argent and Azure the crest from the Arms of Sir Guy Carleton, Baron Dorchester which is "A dexter arm embowed and naked at the elbow the shirt sleeve folded above the elbow Argent and vested Gules; the hand grasping an arrowin bend sinister point downwards proper." Significance: Although the division was named after the British schooner HMS Carleton (Battle of Valcour Island, 11 October 1776), there is no doubt that the original ship was named in honour of Sir Guy Carleton who is accredited with having saved Canada for the British in the defeat of Montgomery and Arnold at Quebec, New Year's Eve 1775-1776. Placing the Carleton crest upon the field of heraldic water indicates connection with the sea. Azure a "patte de griffon" Or. Significance: The device is taken from the Arms of Count Louis de Buade of Pallau and Frontenac, which bore three such griffin's feet upon a blue field. It was at Cataraqui in 1673 that Frontenac met the Iroquois on friendly terms and later established the first fort and stores. Subsequently four sailing vessels were built there for use by René-Robert Cavelier, Sieur de La Salle in the fur trade on Lake Ontario. One of these ships was named Cataraqui which was completed in 1678. This was the beginning of shipbuilding at Kingston. The Iroquois village Cataraqui became Fort Frontenac under French tenure, and later when taken by the British its present name Kingston was given. Kingston is rich in naval history, as it was the operational base for the Fleet in the war of 1812 when much activity centred around His Majesty’s Dockyard there. Description: Vert a bend wavy Argent charged with a like bendlet Gules overall a maple leaf Or. Significance: The maple leaf stems from a previously unapproved badge design for the first Champlain. The bend represents the Saguenay River, which was first explored by Samuel de Champlain, the founder of Quebec, and upon whose shore Champlain is located. The colours green, gold, and red are taken from the Saguenay District flag. Description: Azure an anchor upon two tomahawks in saltire Argent and over all at the fesse point a garb Or. Significance: The anchor and blue background refer to the sea. The tomahawks suggest the Chippawa Tribe, and the wheat sheaf refers to the great wheat area which this division serves. Chippawa was named after HMS Chippawa, one of Commander Robert H. Barclay's ships on Lake Erie in 1812-13. Description: Azure a shake-fork Argent supporting in the middle chief a bezant. Significance: Named for Captain George Vancouver's ship. The devices used in this badge are "armes parlantes," or speaking arms, where pictures of things are employed to illustrate the different syllables of the word. The shake-fork looks like the letter Y, and the bezant is a disc of gold. In this case, in the design we find a rebus on the word DISC-OVER-Y. Description: Argent three maple leaves conjoined on the one stem Gules and in base over the stem a Native Canadian's dexter hand and a white man's dexter hand clasped together proper. Significance: When Jacques Cartier returned to France from his first voyage to America, he took back with him two Native braves. They returned to America with Cartier on his second voyage and acted as guides. They told Cartier about the settlements of Stadacona and Hochelaga on the St. Lawrence River and referred to them by the Huron-Iroquois word Kenneta, which means "a habitation." Cartier thought that they were telling him the name of the country, which he had not yet explored. At the point where the St. Charles River flows into the St. Lawrence, Cartier found many Natives living with their Chief, Donnacona. This was the settlement of Stadacona. In discussion Donnacona spoke freely about the Kenneta (which Cartier wrote as Canada) thus corroborating the information given him by his two Native guides. This was how Canada got her name, as Cartier referred to the then-known area asCanada and marked it as such on his charts. Therefore as a tribute to Chief Donnacona it is quite proper to associate his name with the name of Canada. The ship's badge for Donnacona shows the men's hands in the clasped position and out of them arises the device of Canada, three red maple leaves conjoined on one stem and on a field argent or white. Description: Argent a griffin segreant Azure armed Gules and seme-de-lis Or. Significance: The obvious device for the badge of Griffon is a representation of this mythical monster. As it is named for René-Robert Cavelier, Sieur de La Salle's ship, the first to navigate in the upper lakes in 1679, the griffin is depicted with the colours and devices of Royal France, namely, a blue field powdered or sown with gold fleurde-lis. Description: Vert a crossbow Or in bend sinister with two arrows Argent interlaced one on either side of the crossbow shaft. Significance: The badge design was inherited from the Royal Navy with a slight alteration. In the original badge the two arrows stopped short of the cord on the bow, whereas here the arrows are extended and interlaced with the bow, making the device one unit instead of three. Description: Azure above a base Argent indented of seven charged with two barrulets wavy Azure a plate in front a compass rose Or charged with a fleur-de-lis Azure. Significance: The compass card represents 'Louis Jolliet', the explorer and cartographer from whom the ship takes her name. The blue colour represents the St. Lawrence River. The seven peaks and the 'fleur-de lis' represent Sept-Îles, Quebec, home of the ship. Description: Per chevron Azure and Vert in chief a demi-sun Or rising from the base. Significance: The green section represents a mountain, and in this instance refers to the Malahat Range on Vancouver Island. The sun, although heraldically described as rising from the base is intended to refer to the sun setting in the west and is derived from a similar device in the Arms on the Province of British Columbia. The blue suggests water or the sea. Description: Party per pale Gules and Azure a tower with three turrets Argent masoned Sable. Significance: The Arms of the distinguished French Lieutenant-General Louis Joseph Montcalm-Gozon, Marquis de Montcalm include the following in the second and third quarters: "Sable a tower with three turrets Argent." That is, a white tower upon a field of black. The badge used the tower device placed on a field equally divided red and blue, referring to the historic tenure of Quebec by both British and French. Description: Or a beaver rampant proper gorged with a collar Gules edged Or upon which a roundel displaying the device of St. George. The division derives its name from that of the ketch that brought the early merchant adventurers into Hudson Bay in 1668. Two years later the Hudson Bay Company received its charter, and a trading post and fort was established by them at what is now the City of Edmonton. The Arms of the Hudson Bay Company are basically the Cross of St. George but in each of the quarters there is displayed a beaver (black) in the conventional pose. The badge design is composed of the elements found in the above-mentioned arms. The gold background refers to the wealth of wheat and oil for which the area around Edmonton is today renowned. Description: Argent a demi-lion rampant Azure charged upon the shoulder with a mural crown Or the sinister paw grasping a sword erect proper pommel and hilt Or. Significance: The badge device is taken from the crest in the Arms of Lieutenant-General Sir George Prevost, Bart, who was Governor-in-Chief of the Canadas in 1811, and Commander-in-Chief of the British Forces in Canada during the War of 1812. Description: Or a lozenge Purpure charged with an orb of the first. Significance: The ship's name derives from its location as the literal translation of the Latin 'regina' is 'queen.' The colours purple and gold proclaim association with royalty. The lozenge or diamond is the shape of shield used by an heiress, and the orb denotes regal authority. Description: Barry wavy of ten Argent and Azure over all a bull's head affronty Sable langued Gules armed and annulled Argent crowned with a ducal coronet Gules. Significance: Queen Charlotte is named for a Provincial Marine Corvette, built at Amherstburg in 1809 for service on Lake Erie, and which was named in honour of Queen Charlotte, wife of George III, King of England, 1760-1820. Queen Charlotte was the daughter of Charles Louis, Duke of Mecklinburg, and for this reason the bull's head from the Mecklinburg's coat of arms, with appropriate differing, has been chosen. Description: Argent on a saltire couped Azure a plate four bars wavy Azure charged with a maple leaf Gules. Significance: In connection with the name Scotian it is fitting to use the Cross of St. Andrew as it appears in the Arms and flag of Nova Scotia. However, in order to show more clearly that the ship is Canadian, the saltire is marked at the centre with a roundel bearing an emblem of Canada, a red maple leaf upon heraldic water. Description: Azure an estoile Or charged with a maple leaf Gules. Significance: The device used for the badge is an "estoile" or heraldic star. The red maple leaf, an emblem of Canada, indicates that the "star" pertains to Canada. Description: Sable an annulet Argent debruised with a panther crouching to spring Or. Significance: The name "Tecumseh" is said to mean a panther crouching to spring, or a meteor, which was called by the Natives the panther of the sky. According to Ethel T. Raymond's Chronicles of Canada series, when Tecumseh was approaching manhood, he went into the forest alone to endure hardship and fasting, in order to prove himself worthy of becoming a brave. After days of hunger and roaming in the deep forest he threw himself exhausted at the side of a brook where he fell asleep and dreamed of a cluster of stars out of which there shot one brighter than the rest and with a shining tail. This flaming meteor which resembled a crouching panther ready to spring, recurred a number of times, and Tecumseh accepted this as his symbol and "the radiant guardian of his destiny." Tecumseh showed genius and bravery as a leader in uniting the various tribes from the South Mississippi into Canada to form a Confederacy which fought at the side of Britain. In recognition of this, the annulet or circle is introduced into the design to suggest the unity that he achieved amongst the tribes. Description: Azure awinged unicorn rampant Argent armed unguled crined and winged Or. Significance: Named for the Royal Navy ship that explored Hudson's Bay in search of the Northwest Passage. This badge design was furnished by the Admiralty who have graciously granted its use as the ship's badge. The mythical animal shown in the badge is actually awinged horse or pegasus, but having the horn coming from its head it is considered to be a winged unicorn, rather than a horned pegasus. It has been the custom to add wings to any figure held in veneration, from the angels of Christianity to Mercury and Pegasus. Because the name Unicorn is highly esteemed in British naval annals, the wings were added. Description: Azure a white rose of York rayonne Or. Significance: The ship was named after the former name of the City of Toronto, in which it is located, and the first British commercial craft on Lake Ontario. 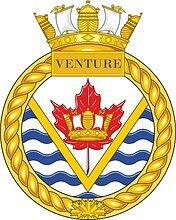 The badge design was furnished by the Admiralty who have graciously granted its use as the ship's badge for York.